French blogger Albocicade writes to say that he has compiled a list of Syriac and Arabic chronicles on his blog. I found this rather useful, to see it in a condensed form. Better still, he has linked the entries to online versions of the text or translation. Very useful, I think! The Hill Monastic Manuscript Library, under Fr Columba Stewart, has been photographing manuscripts in the East for quite a few years now, and creating microfilms of them. How necessary this work is, has been shown graphically in recent weeks by the barbaric destruction of Assyrian monuments in Iraq by Muslim thugs, apparently out of sheer savagery. Excerpts from the history of Agapius of Manbij falsely ascribed to him: CMA 7-13-12. Kitab al-ta’rikh: CMB 8-15; 12-5; 13-3. Erm, right. I think we want the second one, the Kitab al-Tarikh. So what is CMB 8-15? More to the point, how do I find the microfilm of this on Archive.org? Here I ran into difficulty. I learned from the catalogue that CMB means volume B of some other catalogue of the mss of the Coptic Museum. So far so good. It looks as if this is connected to the name of the uploaded PDF. CMD10-8 is https://archive.org/details/CMB10-8, for instance. So … no luck with al-Makin, then. But perhaps it will come. In the mean time, look around. There are also Slavonic texts up there. It is a huge treasure chest – if we can find anything. There are quite a number of manuscripts of the history by the 13th century Coptic historian al-Makin ibn al-Amid. I have listed these in a previous post here. Martino Diez, in his important article on the subject has obtained copies of three of the manuscripts. This is no small feat in itself, as I can bear witness myself after attempting it. Indeed a look at the prices on the Bodleian website today was quite enough to dissuade me from trying to obtain a copy of any of their manuscripts! I have commented before on the corruption involved in charging huge sums for reproductions of public-owned manuscripts. Investigation shows that the three manuscripts belong to two different recensions. One, the shorter, is present in ms. Vat. ar. 168 and in Pococke 312, and the other, longer, preserved in ms. Paris BNF ar. 4729. The exact relationship between the two recensions seems, on first sight, difficult to establish. The existence of two families of witnesses was already highlighted by Gaston Wiet in a long note to the History of the Patriarchs of Alexandria. The French researcher proposed to call the first family the vulgata and assigned to it most of the witnesses, notably Paris BNF ar. 4524, Vat ar. 168 and 169, Borg. ar. 232, and Pococke 312. All the same, Wiet noted the existence of a second family, “completed and retouched using [the Annals of] Eutychius, such as ms. Paris ar. 4729.” “This manuscript reveals that its copyist had literary, confessional and chronological concerns: the material of al-Makin is treated very freely. But the modifications at bottom belonging to the Chronicle [of al-Makin] have not been invented by the copyist. It is obvious that he worked with a copy of the Annals of Eutychius before him.” For Wiet, therefore, the vulgata is the original work of Ibn al-Amid, while ms. Paris ar. 4729 (which we will refer to as the “expanded” recension) represents a later elaboration, contaminated from other sources, notably Eutychius, and not without literary ambitions. The text clearly shows that the vulgata represents an abridgement (muhtasar) of the chronicle, made by the author himself. He states, in fact, that, after completing a first version of his work, he came into possession of new sources (on the origin of the world, the shape of the world, on the patriarchs, on the kings of Persia) which enriched the treatment of certain periods. However the work was already too long, and someone, “to whom it was not possible to say ‘no'” (“someone who sought to make his request accepted and to assist in the pursuit of his desire”) asked Ibn-al `Amid to make an abridgement which contained all the best known events. And this is exactly what is called the vulgata of Ibn-al `Amid. He then explores what the “expanded” edition is. Is it indeed the original version, or a longer version, enriched with further information before being condensed? He argues that it is the former; this is, indeed, the original version produced by al-Makin. He notes that the titles and explicits of the copies indicate something – again this is not translated so I can’t say what that is! – and then details differences. Diez does not seem to deal with the question of contamination from Eutychius, however. If both versions are indeed by the author, any future edition and translation needs to include both. But clearly there is more work to be done. Graf’s Geschichte der christlichen arabischen Literatur online! The site includes all five volumes of Graf’s GCAL. It may be 60 years old but it is still the only handbook of Christian Arabic literature. The site also has a vast array of manuscript-related catalogues and resources. Posted in From my diaryTagged Information access, Other Arabic, Syriac6 Comments on Graf’s Geschichte der christlichen arabischen Literatur online! I have finally managed to find some hard information on Ibn Abi Usaibia (translation here), the two editions of the text, and the manuscripts of both. What follows may be hard going; but it is almost entirely hard data. A google search turned up this site. It gives, thankfully, the GAL reference for Ibn Abi Usaibia, which means that, at long last, I can find the entry. Here is the reference on the website. BROCKELMANN KARL (1868-1956), Geschichte der arabischen Literatur. Weimar, Berlin 1898 ; Leipzig, C. F. Amelang 1901 [vi-265 p., 23 cm]; Leyde, E. J. Brill 1943 [2e sup.] ; Leyde, E. J. Brill 1996 [augm. et préface de Just Witkam] (I) p. 325-326; (sup. I) p. 560. I.e. p.325-6 of volume 1 of the 1st edition, plus p.560 of vol. 1 of the supplement. In the interests of googleability, here’s a transcription, with a few extra line breaks to make the detailed info more comprehensible. 10. Muwaffaqaddin a. ’l-`Abbās A. b. al-Q. b. a. Usaibi`a as-Sa`di al-Hazragi, geb. nach 590/1194 in Damaskus, wo sein Vater Augenarzt war, studierte Medizin in seiner Vaterstadt und am Nāsirischen Krankenhaus zu Kairo; besondere Anregung verdankte er dem bekannten Arzt und Botaniker b. al-Baitār (S. 492). 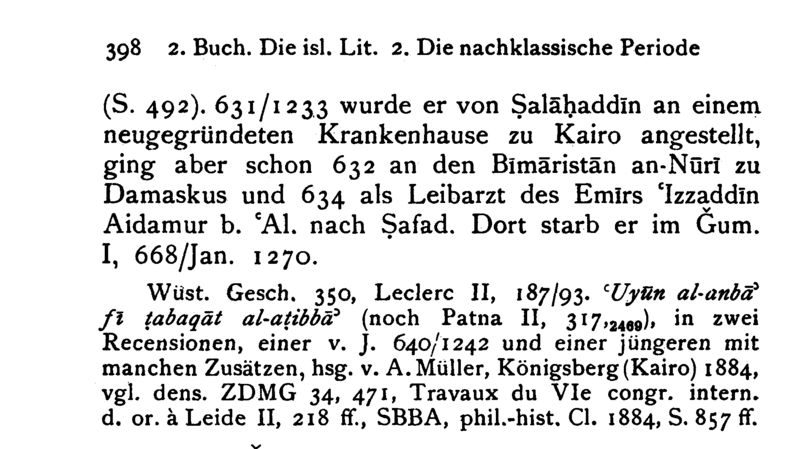 631/1233 wurde er von Salāhaddin an einem neugegründeten Krankenhause zu Kairo angestellt, ging aber schon 632 an den Bimāristān an-Nuri zu Damaskus und 634 als Leibarzt des Emirs ‘Izzaddin Aidamur b. `Al. nach Safad. Dort starb er im Gum. I, 668/Jan. 1270. Wüst. Gesch. 350, Leclerc II, 187/93. `Uyun al-anbā’ fi tabaqāt al-atibba’ (noch Patna II, 317,2469), in zwei Recensionen, einer v. J. 640/1242 und einer jüngeren mit manchen Zusätzen. Hsg. v. A. Müller, Königsberg (Kairo) 1884. Vgl. dens. ZDMG 34, 471, Travaux du VIe congr. intern, d. or. à Leide II, 218 ff., SBBA, phil.-hist. Cl. 1884, S. 857 ff. 10. Muwaffaqaddin a. ‘l-`Abbās A. b. al-Q. b. a. Usaibi`a (1) b. Halifa as-Sa`di al-Hazragi, geb. nach 590/1194 in Damaskus, wo er 632/1234 am Bimaristān an-Nuri angestellt wurde; 634 ging er als Leibarzt des Emirs `Izzaddin Aidamir b. `Al. nach Sarhad und starb dort im Gum, I, 668/Jan. 1270. Nallino, `Ilm al-falah 64ff. K. `Uyun al-anba’ fi tabaqat al-atibba’, Hdss. noch Münch. 800/1, Wien 1164, Leid, 1062/4, Paris 2113/7, 5939, Nicholson JRAS 1899, 912, Fātih 4438, Top Kapu 2859/60, Sehid `A. P. 1923, Yeni 891/2, Köpr. 1104, Dämäd Ibr. 935, Kairo2 V, 275, Mosul 25,42, XIV, 26,78, Rampur, I, 642,176, Bank. XII, 786, Abkürzung Paris 2118. S. noch Hamed Waly, Drei Kapp, aus der Ärztegeschichte des b. a. Us., med. Diss., Berlin 1911. (1) So die Hds. Brit. Mus. This is the origin of the “two recensions” story; there is one made in 1242 AD, and a “younger one, with some additions”. The details may be found in Müller, Arabische Quellen zur Geschichte der indischen Medizin, in the ZDMG 34, starting on p.469 f., which may be found online here. This also gives a list of manuscripts of the two recensions. The JRAS (Journal of the Royal Asiatic Society) article is online, and consists of a list of Arabic manuscripts owned by orientalist Reynold A. Nicholson. The Ibn Abi Usaibia ms. was copied in Constantinople in 1136 A.H. (=1758 A.D.), and has the inscription, “E. Libris Theodori Preston Coll. S. S. Trin. Cant. Socii Damasci 1848”, and a note stating that Mr Preston purchased it in Damascus for 900 piastres. I wonder where his manuscripts are now. So we’re getting some real, useful information at last here. Curious that the GAL mentioned a British Museum manuscript in the footnote as the source of the author’s full name, but does not give the shelfmark for it! It is, no doubt, British Library Add. 7340, an exemplar of the longer recension, mentioned in the ZDMG article. The Muller edition of Ibn Abi Usaibia is only in my hands in a rather rubbish-looking reprint, which I suspect is incomplete. I wish the original was online! Abu ‘l-Abbas Ahmad Ibn al-Kasim Ibn Khalifa Ibn Abi Osaibia, surnamed Muwatrak ad-Din and a member of the Arabic tribe of Khazraj, was born in Damascus, where his father was an oculist and his uncle, Rashid ad Din Abu ‘l-Hasan Ali, director of the hospital for the treatment of the maladies of tbe eyes. He studied philosophy under Rida ad-Din al-Jili, and profited greatly by the lessons of Abu Muhammad Abd Allah Ibn Ahmad Ibn al-Baitar, with whom he made a number of botanical excursions. Ibn al-Baitar is the author of the Dictionary of Simples, a deservedly celebrated compilation of which Dr. Sontheimer published a German translation, at Stuttgard, in the year 1840. Ibn Abi Osaibia kept up for some time an epistolary correspondence with the celebrated physician and philosopher, Abu al-Latif. In the year 684 (A. D. 1236-7), he got an appointment in the hospital founded at Cairo by the sultan Salah ad-Din (Saladin). Some years after, he accompanied the emir Izz ad-Din Aidmor to Sarkhod, in Syria, and he died there, aged upwards of seventy years. His history of the physicians, entitled Oyun al-Anba fi Tabakat al-Atibba (Sources of information concerning the physicians of divers classes), contains a number of curious and highly interesting articles. The list of its chapters has been given by Mr. Wustenfeld in his Geschichte der Arabischen Aertze, No. 237, and from that work are taken the indications given here. In the catalogue of the Bodleian library , tome II. p. 131. et seq. will be also found this list of chapters. Fontes relationum de classibus Medicorum. A Latin translation by Reiske is at Copenhagen, we are told, no doubt in manuscript. Liber experimentorum et observationum utilium, about which we are told nothing further. Liber de monumentis gentium, a fragment not completed. That the titles are in Latin tells us that Wustenfeld just copied this from earlier modern writers. But then follows a list of chapters. Some are marked with an asterisk (*), indicating that the chapter is not found in Reiske. Others are marked with a dagger (+), indicating that “Nicoll” does not contain them. Some titles are written in italics – Wustenfeld doesn’t say why. The differences between the contents given by Reiske, and that by Nicoll, in later sections of the book are fairly considerable. Clearly there are different versions of this text in circulation. If we look for Ibn Abi Usaibia’s name in the Kopf translation (here), we quickly find that it appears as a source for various statements. This itself suggests that the author of the work is someone else, someone later. Adam McCollum is the dedicated cataloguer of manuscripts at the Hill Monastic Manuscript Library run by Fr. Columba Stewart. The latter is doing an enormously valuable job; of getting copies of all the Syriac and Arabic manuscripts located in oriental monasteries in places like Syria and Iraq. The urgency and importance of this task should be obvious to us all at the moment. Adam’s task is seemingly more prosaic; to catalogue the results. In practice this requires a wide familiarity with the literature and a great deal of dedication. But it also gives him the chance to make original finds, and to publicise the texts. Among some manuscripts at the Church of the Forty Martyrs, Mardin, that I have recently cataloged are some that deal with the hagiographic Qartmin trilogy of the stories of Samuel, Simeon, and Gabriel. Some of this material has been published (and even partly translated), but the published texts are not easy to come by. While going through these texts I came across one episode in The Story of Šemʿon (Simeon) in Syriac and in Arabic that, not too short and not too long and of enough entertainment value and philological interest, called for greater readership than it currently has residing in manuscripts. The ease of making texts available this way — from manuscript to electronic file to the internet in a matter of days, with the option of correction always there — has the potential to change greatly any academic field based on texts, and I hope that more such text presentation will appear. Comments especially on this general prospect are encouraged! Emphasis mine. He is quite right. The PDF presents the text, in Syriac and in Arabic, in a perfectly serviceable form. And … the world can see it and use it. A correspondent has written and let me know that French translations exist of chunks of Ibn Abi Usaibia’s History of Physicians. They were done by Sanguinetti in the Journal Asiatique, with the chunks starting in 1854. I’ve seen five bits so far. The first chunk is here (1854, series 5, tome 3, p.230 f.), and includes a useful biography of Ibn Abi Usaibia. The second part is here (1854, series 5, tome 4, p.177 f.), mostly from the second chapter of the book, about Asculapius. The third part is here (1855, series 5, tome 5, p.401 f.), extracts from chapter 7. Unfortunately the BNF does not have 1855 series 5, tome 6 online, which must contain the fourth part — tome 7 does not contain it. [Update: it’s here at Google books, p.129] The fifth part is here (1856, series 5, tome 8, p.175 f.), extracts from chapter 4 (Hippocrates). That seems to be all, as the next tome (9) contains an article also by Sanguinetti, on p.392, headed Biographical notices of various physicians, taken from an Arabic work by Assafedy: French translation with notes. All this material is useful to have. I thought that I would translate chunks of Sanguinetti’s introduction, which also includes a biography of Ibn Abi Usaibia. Note that I have not attempted to change his transcription of Arabic names from the older French style into those used today. 1. No. 674 of the Supplement arabe, drawn up by Reinaud, quarto manuscript, 150 folios, but incomplete and only containing the first 8 chapters. It is in very good condition, containing here and there marginal glosses which are sometimes interesting, and is, in my opinion, the best of all the manuscripts of this work in the Bibliotheque imperiale. This in particular allowed me to establish the text of the extract I give here. Part of this text is in rhymed prose, and is far from easy, and is ready for printing. I think that reading and studying it would offer more than one kind of interest and utility, and I would hope that a favourable occasion will present itself to publish it. 2. No. 756, ancient fonds arabe; it is likewise in quarto, is composed of 138 folios, and also contains only the first 8 chapters. This ms. is somewhat mediocre, and certainly not as good as the preceding one. 3. No. 873, ancient fonds arabe: this is a small volume, small quarto, of 111 folios, and is an abridgement of the whole work. Its condition would be very good, but unfortunately it has so suffered from damp and from other causes that it is often illegible. Finally, as may be seen below, I also made use of the manuscript of this work which is in the Bibliotheque imperiale, Supplement arabe 673, and which is the only one that is complete. This is a folio volume, of 273 folios, modern and mediocre. I cannot avoid saying something about the Arab author and his works. Some details on this may be found in the work of Abou’l mahacin, under the year 668 AH, at the end , in Hadji Khalfah, Reiske , Wustenfeld , etc, but particularly in the last two chapters of Ibn Abi Usaibia’s own work, where the author speaks several times about his family and himself. I will content myself with giving, in summary, a small number of the most important facts. The name of our author was Mouwaffik eddin Abou’l’abbas Ahmed, son of Abou’lkacim, son of Khalifah Alkhazradjy , but he is better known under the name of Ibn Abi Usaibia. He was born at Damascus, late in the year 600 AH (1203 AD) and he learned medicine from his uncle Rachid eddin ‘Ali, son of Khalifah, practitioner of medicine and director of the hospital at Damascus for eye problems. He also studied under his father, who was above all a surgeon and oculist. His teacher of philosophy was the jurisconsult and philosopher Radhy eddin Aldjily (i.e. of Ghilan). He had connections with Ibn Albaithar, who gave him some lessons on botany, with ‘Abdallathif and others among his famous contemporaries. In the year 634 AH (1236-7 AD) Ibn Abi Osaibia went to Cairo, where he practiced medicine, and was even employed in a hospital. About a year later he went to Sarkhad, in Syria, and entered the service of the commandant ‘Izz eddin Aidemir, son of Abdallah, whose first doctor he became. He died in the month of djoumada I, in the year 668 AD (January 1270 AD). He was then almost a septugenarian, and indeed older than that according to Abou’l mahacin. The principal work of Ibn Abi Usaibia is, without question, his History of physicians, as the real title indicates: “Sources of information on the subject of the classes of physicians”, and which was regarded as a classic in its genre. He also left another book of practical medicine, entitled “Useful experiences and observations” . He also had begun a third work, which he did not finish, but which he intended to call “Monuments of the nations and histories of the wise”  Finally Ibn Abi Usaibia was the author of various pieces of verse, one of which, among many, was the eulogy of the emir Amin Addaoulah, and Abou’; mahacin gives a fragment of this.